Unite the Blue Team! 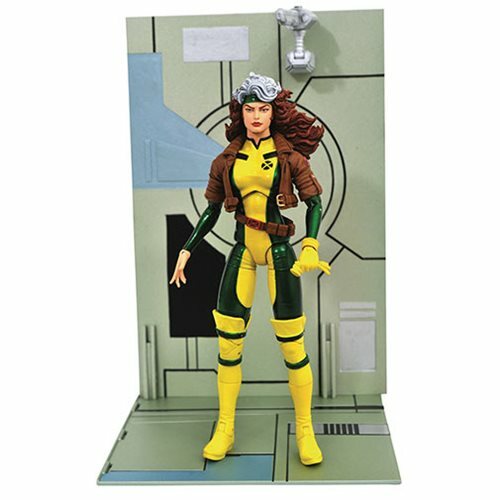 DSTexpands on their X-Men offerings with the latest figure inthe Marvel Select action figure line - Rogue! The Southernbelle with the ability to steal your powers joins Beast,Gambit, Wolverine and Cyclops to form the ultimate actionfigure strike force! With interchangeable hands, includingan ungloved hand and one hand holding a glove, Roguewears her popular 1990s outfit, and comes with a DangerRoom diorama base. Connect it with your other X-Men toform a larger diorama! Packaged in display-ready Selectfigure packaging with side-panel artwork.